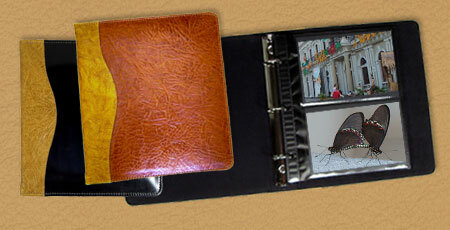 If you are looking for a great way to preserve your 4x6 photos you may want to consider our leather 4x6 photo album. Although 4 X 6 photos may be mounted in any of our books, this album is a practical choice if you're not in the market for a large leather photo album. Its pages are set up in a 2-Up 4x6 horizontal orientation, and load very easily. Like all of our products, the 4X6 Two Up leather photo album may be personalized in any way that you like, and it may be assembled from any combination of the leathers that you like. Give us a call anytime to discuss how we might create a personalized 4x6 leather photo album for you. Please feel free to browse our selection of custom leather portfolio albums, large leather photo albums, and other beautiful leather products. If like most people you enjoy showing off your pictures of your pet project, a new baby, your family, or pets, you may want to take a look at our beautiful leather photo envelopes. They may be crafted from any leather finish that you choose, and personalized any way that you like. They're lined with a beautiful photo safe suede material, and have a secure magnetic closure to protect your photos for years to come. They also make wonderful purse organizers for receipts, credit cards, or whatever you may want to keep organized. Please feel free to browse our leather photo albums, leather photo portfolios, leather presentation portfolios, leather scrapbooks, and leather guest books. All products may be personalized, and crafted from the finishes of your choice. To place an order please call us!